Like most of the Indian recipes, this is very adaptable and are cooked in different ways, with different lentils and different spices depending on the region where it is cooked and definitely on the mood of the chef! I have different kinds of Palak Dal that I make at home. This one here is my favorite, not just because it tides in nostalgia, but also because of the roasted mung dal that is used here. It is very popular to lightly dry roast the yellow mung dal before cooking in West Bengal. Roasting the lentils, brings out the beautiful aroma that will hang around your home for a long time. Don’t forget H2Ope for Haiti! The raffle is open and live now, and will run till the 28th of February. Buy ticket for minimal price and you can win $50 Amazon gift card (my donation), or any other wonderful prizes listed there. In a dry thick bottomed skillet, lightly roast the mung dal/lentils till they are fragrant and golden. Cool them and wash them. In a large pot over medium-high heat combine the dal and water. Bring to a boil, then add the turmeric and salt, ginger, 1 green chili, slit or broken. Reduce the heat, and simmer till the lentils are about half done. Add the spinach and simmer until the lentils are soft, about 1 hour /more or less (or you may pressure cook the dal/lentil). I add the spinach later during cooking so they are not overccoked and still maintains the dark green color. The lentils should not dry up while cooking, they have to have the soupy consistency. If you need more water, do add more. Remove from heat when the lentils are cooked and soft but not mushed up. In another pan, heat the oil/ghee/butter and cumin and fry until the cumin sizzles. Add the green chili and asafoetida/hing if you’re using it and fry for about half a minute. Add the red chili powder and the tomatoes and cook till the tomatoes are mushy. Add the cooked lentils, sugar and spinach to this pan, cover and allow to cook/simmer for another ten minutes. Taste, and season with more salt if needed. Squeeze some fresh lemon juice on the top before serving. Serve hot with rice or roti. This is my entry to MLLA#20, an event started by Susan of The Well Seasoned Cook and hosted this month by Rachel of The Crispy Cook. Is that a comfort food 🙂 I like ging and cumin in ur dhal, is different than what I make it! Such a comforting and flavorful dish! I have a lot of spinach to use right now and would love to make this! looks so comforting nd yummy,. This looks so delicious. Its been a while since I ate Dal Palak…Love it! Totally delicious, I love how the beans are roasted first. 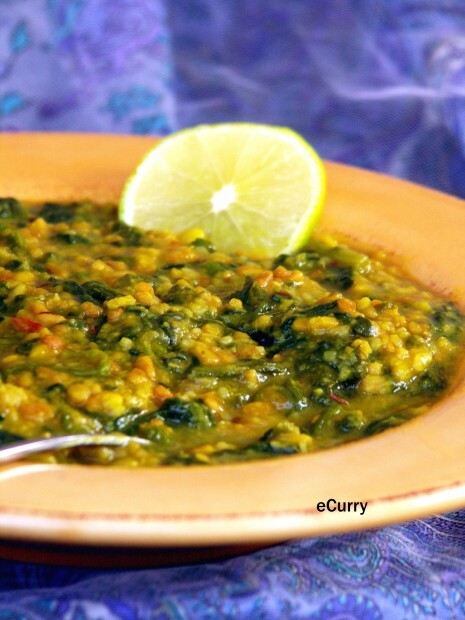 Moong dal and spinach is a fantastic combo, the colors compliment each other so well! I love daal when it is thick like the one you have. Grating tomato is new to me. Other thatn that, I make it pretty much the same. Look good. Great combination. I’ve never made lentils with spinach before. Its a hearty comfort food.Love the thick daal Soma.I too have read and tried grating tomato from Madhur Jaffrey’s book.This makes an instant puree removing the skin.Love the way you explain everything. I love this combination and make it quite often at home!!! Yummm!!!! Lovely Clicks! Interesting combination. I love spinach and lentils so I’m sure I’d enjoy a hot bowl of this dish. This dal and rice would be my all time comfort food. Mostly it is plain, this i have to make. My favorite! I love the Saravana bhavan version very much,I have to try your version looks appealing! There couldn’t be anything healthier that tastes so good. Great job. Nice one…..we too love dal palak combination, atleast once a week it’s must…..My blog is all spinach recipes now-a-days as he wants to eat spinach everyday….. I just need a roti to slop it all up.. I could really go for a bowl of this deliciousness right now. Thanks for sending this great recipe over to My Legume Love Affair. Wow oh wow, and this is just the perfect weather for a dish like this one. Roasting the lentils … that should change everything. This is on my must try list! What a great comfort meal–sounds exactly like the perfect dinner for this evening! Love the vibrant color. 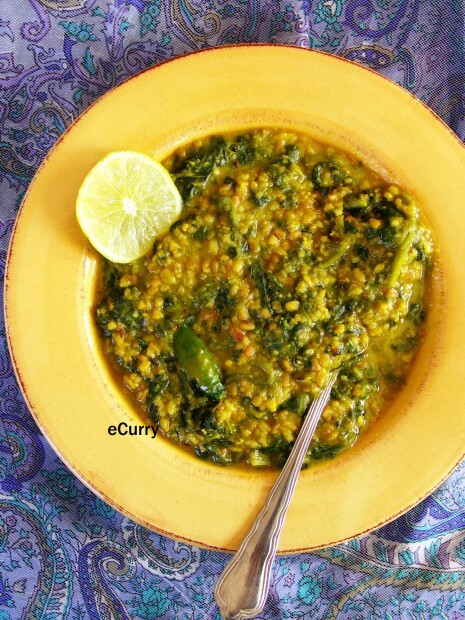 Lentil with spinach sounds great! I love lentils, but never tried them with Spinach. Perfect to be eaten with flat bread! That looks so nice, Soma..Love the rustic bowl!! what an absolutely delicious and healthy food! love the recipe! The red lentils 🙂 If I do not use the moong, I usually use the red lentils(masoor dal) with the spinach which is my favorite. This is a very adaptable recipe and as I said it is done with different lentils and different seasonings. Some use chopped onion and garlic .. rather than what I have used. Adapt it like you said the mustard oil. that is what cooking is about. don’t hesitate to ask if you need to ask anything else. I’ve been eating a lot of lentils lately… Not sure why; it must be some sort of coincidence really but this looks like another great dish to try out. Lovely and colorful! All of your soups look so good. I also want to try the tomatoe one that you recently posted. A georgous & ooh so tasty dish!! I so love spinach & to add lentils with this & so many spices must taste awesome! I happen to have some spinach I need to use up. This looks like just the hearty and healthy dish to use it in. Thanks for sharing this lovely recipe! This does sound like perfect comfort food. I could enjoy this every day! Nice pictures, what lens have you used? I made this and had it for dinner last night. It was terrific. I’m used to using onion and garlic in most of the Indian dishes I make, but the fact that this recipe omits them, lets the rich earthy flavor of the spinach come through in each bite of the dish. Roasting the mung dal was a nice technique also. The only thing I did that was not part of the recipe was to add a handfull of curry leaves, because I had ’em, and I love curry leaves! Cooking is all about getting creative, isn’t it? ; so glad that you made it your own. The eastern part of India, when I belong has a lot of recipes which do not use onion and garlic. They are awesome even without them and comfort food for me. I tried out thus recipe yesterday with jeera rice and it was wonderful. Such a comfort food feel. 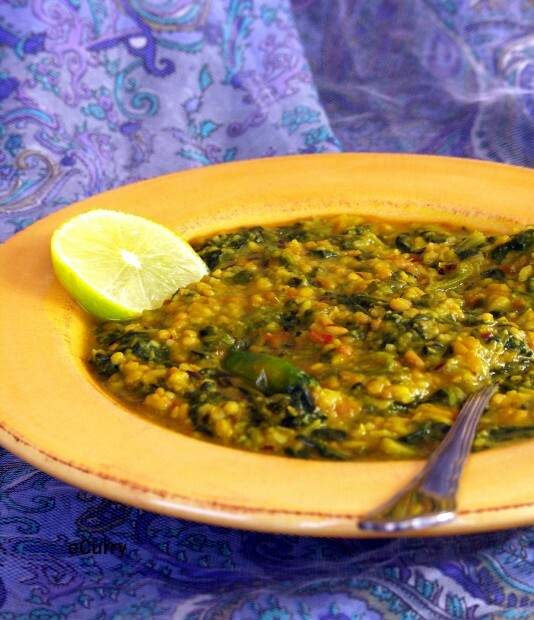 Really different from the regular palak dal …..we loved it! I had missed that. The post has been updated. The sugar is added when the lentil and spinach goes in the pan with the tomatoes. Thanks a bunch for letting me know. Sorry, just saw the 4 cups listed at the end. Off to make this lovely dish! Palak Dal looking awesome and mouth watering. ok, im curious if it should really be an hour? after 30 mins, i checked in and my dal was mushy mush mush. oh! and there are two times you say to add the spinach? Which is it?